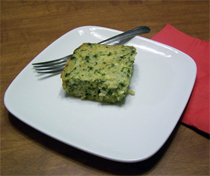 This dish goes well as a side dish to any meal, but with the protein from the eggs it can easily serve as a main dish. It’s also a great way to use up that left-over rice in your fridge. It tastes great and the best part is that it’s good for you too! Preheat oven to 350 degrees F/176 C. Cook and cool rice and spinach if necessary. In a skillet saute onion in hemp or olive oil until tender. Remove from heat and set aside to cool. In a large bowl beat eggs slightly. Mix in milk, cheese, rice, spinach and seasonings. Stir in cooled onions and place in a baking dish coated with cooking spray. Bake for 35 -45 minutes or until it’s very lightly browned on top and set. Let set on top of stove for 5-10 minutes before cutting into squares.